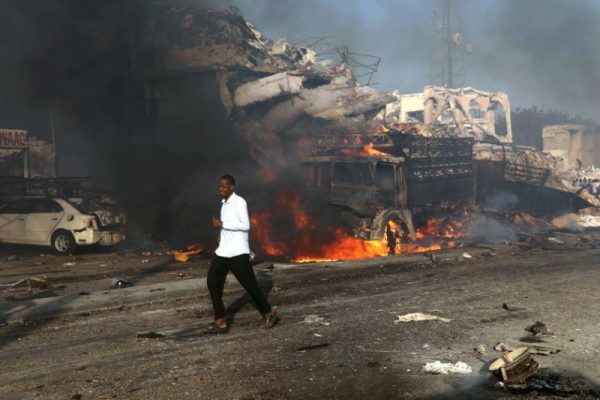 MOGADISHU—More than 200 people were killed by twin bomb blasts that struck busy junctions in the heart of Somalia’s capital Mogadishu, officials said on Sunday, marking the deadliest attacks since an Islamist insurgency began in 2007. President Mohamed Abdullahi Farmaajo declared three days of national mourning and called for donations of blood and funds to victims of Saturday’s attack. At least 100 others were wounded. “Today’s horrific attack proves our enemy would stop nothing to cause our people pain and suffering. Let’s unite against terror,” he tweeted. Police said a truck bomb exploded outside a hotel in the K5 intersection that is lined with government offices, restaurants and kiosks, flattening several buildings and setting dozens of vehicles on fire. Two hours later, another blast struck the capital’s Medina district. “We have confirmed 200 civilians died in yesterday’s blast. We understand the death toll is higher than that. Many people are still missing their relatives,” Abdifatah Omar Halane, the spokesman for Mogadishu’s mayor, told Reuters. A spokesman for Aamin Ambulance service said it knew of more than 250 people wounded during the bombings on Saturday. “Some people who searched for their relatives just found unrecognizable body parts,” its director Abdikadir Abdirahman told Reuters. “In our 10 year experience as the first responder in #Mogadishu, we haven’t seen anything like this,” tweeted the ambulance service, which is reliant on private donations and the only free ambulance service in the city. 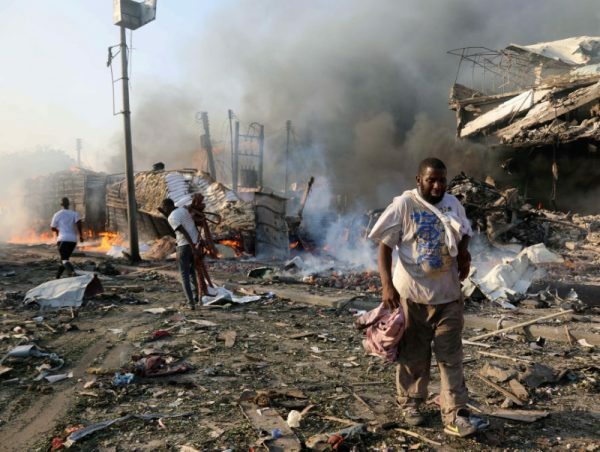 “We’re mourning the loss of 5 Somali Red Crescent volunteers, also killed in this attack,” tweeted the International Committee of the Red Cross. Police and emergency workers searched the rubble of destroyed buildings on Sunday. They had recovered dozens of corpses the night before, most of which were charred beyond recognition. Hundreds of people came to the junction in search of missing family members and police cordoned off the area for security reasons. 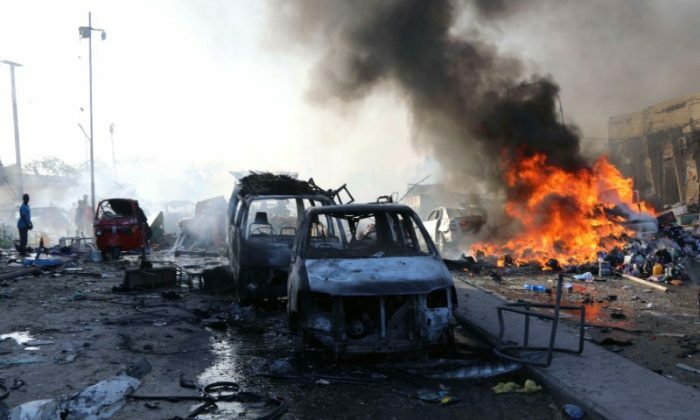 There was no immediate claim of responsibility, although the Islamist terrorist group al Shabaab, which is allied to al Qaeda, stages regular attacks in the capital and other parts of the country. The group is waging an insurgency against the U.N.-backed government and its African Union allies in a bid to topple the weak administration and impose its own strict interpretation of Islam. The militants were driven out of Mogadishu in 2011 and have been steadily losing territory since then to the combined forces of African Union peacekeepers and Somali security forces. But al Shabaab retains the ability to mount large, complex bomb attacks. Over the past three years, the number of civilians killed by insurgent bombings has steadily climbed as al Shabaab increases the size of its bombs.